CANTON, Mass. 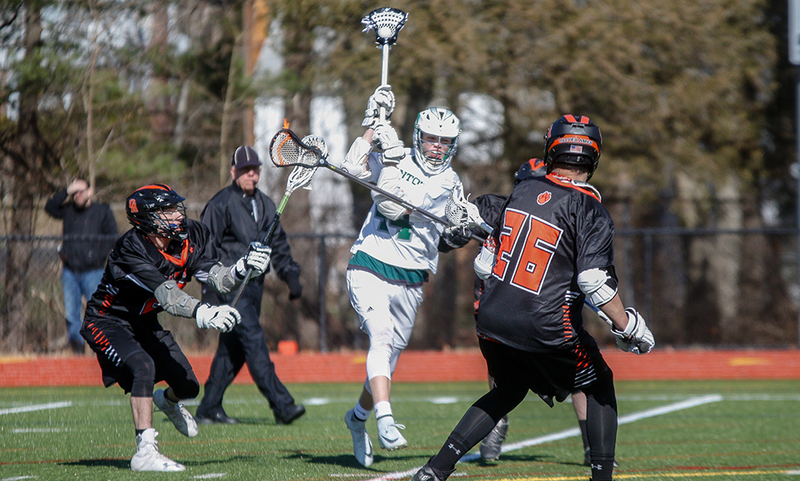 – In the opening game of the season for both teams, Canton held off a second half push from Oliver Ames to record a 12-6 win on Thursday afternoon. The Bulldogs built a four-goal advantage over the first 24 minutes of action, taking a comfortably 7-3 lead into halftime. 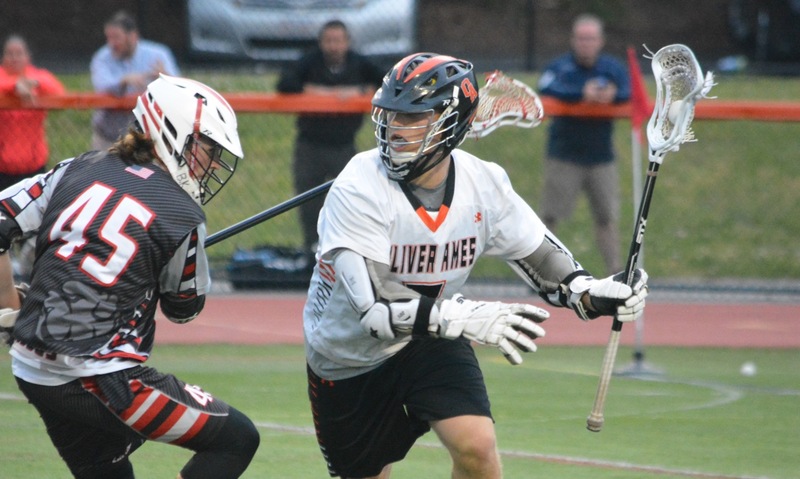 But Oliver Ames came out with renewed energy in the second half, scoring a pair of goals in the third while blanking Canton’s offense to make it a two-goal game (7-5) heading into the final frame. But Canton responded well, scoring its first of four straight goals less than two minutes into the fourth to fend off the Tigers’ comeback effort. Canton started the contest strong, scoring the opening goal less than a minute in when junior Griffin Roach charged up the middle and ripped a shot into the back of the net just 55 seconds in. The Bulldogs kept their foot on the pedal as junior Mike Shaw took advantage of an OA turnover and scored from in close after a nice shot fake, Roach took a handoff from classmate Matt Martin, changed direction to get past a defenseman and rifled one in, and Ryan Sullivan took a feed from Shaw before firing a low shot, giving Canton a 4-0 lead eight minutes into the game. Oliver Ames picked up some momentum before the end of the quarter by getting on the board. Sophomore Shane Kilkelly dodged past a defender, faked a shot to draw the attention of two others and then slipped a pass right in front to classmate Hunter Costello for a goal in tight. The Tigers capitalized on that momentum to begin the second quarter, cutting the deficit to two when senior Owen Gallagher used his speed to wrap around the goal and a bounce shot to make it 4-2 just 32 seconds into the frame. 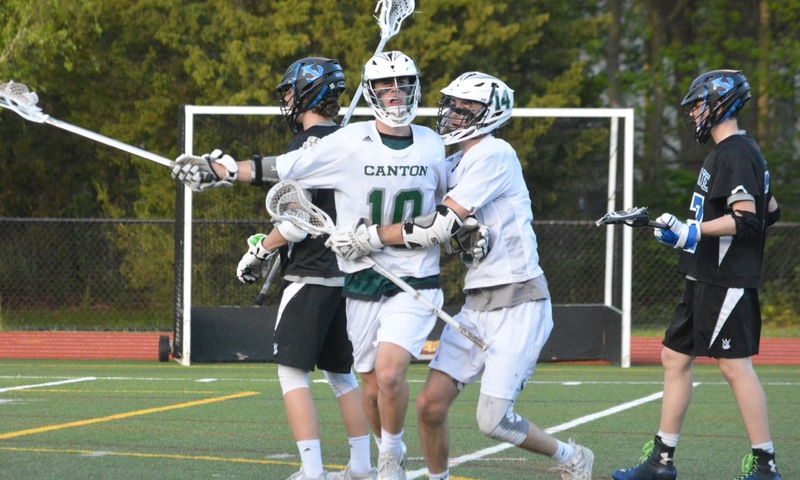 Canton sophomore David Allen extended the advantage back to three when he scored from a tight angle with 6:40 to go in the first half, only for Kilkelly to answer just over 30 seconds later. Kilkelly backed his way towards goal and used a nice spin move to create space for his shot. Roach had the answer for Canton, scoring back-to-back goals in under a three-minute space. Just a minute after Kilkelly’s strike, Roach rushed up the middle and fired a bounce shot that snuck just under the bar. The junior cashed in again up the middle, whipping a hard shot to make it 7-3 heading into halftime. OA got off to a strong start in the second half when senior Jack Lang put the Tigers on the board 38 seconds in, making it 7-4. That goal seemed to set the tone for the period as OA controlled for the majority of the 12 minutes. But it wasn’t until the final two minutes that OA cashed in again. Sophomore Frankie Ireland made a nice hustle play at midfield to gain possession and then came sprinting into the zone. He found Costello in the middle, who instantly returned the pass on a give-and-go and Ireland tucked his shot from in close just under the bar at a tight angle it to make it 7-5. “In the third quarter we started executing our offense,” said OA first-year head coach Ben Devlin. “We controlled the ball a little bit more, we worked it around, and we were running our offense the way its supposed to be run. In the fourth, we started to press a little. We were chasing the score. I think the kids thought the deficit was a little bit more than it was so they started to force a little bit. We started playing aggressive and they were able to beat it at times. Canton put an end to that momentum early in the fourth. Albert found Shaw cutting through traffic in front less than two minutes in to make it 8-5. “We were better when we moved the ball and moved around,” Bendell said. “We did a ton of standing around on offense. We tried changing formations…the guy with the ball would end up just standing, or maybe he was moving but then everyone else was watching. I think that’s early stuff, but we talked about moving off the ball a little bit more in the second half. It got better as the game went on, and then in the fourth, they had to press us and that made us move more. Roach (with 8:14 left), Albert (7:43) and sophomore James Murphy (5:49) scored in succession during the fourth to pull away from the Tigers. Costello added his second, again on an assist from Kilkelly with 2:35 left. Albert completed his hat trick with just over a minute left to cap the scoring. Bendell also noted he felt that freshman TJ McCabe’s performance at the faceoff X was a big factor in helping the Bulldogs earn the win. Canton senior Charlie O’Connor, the team’s normal FOGO specialist, is out hurt and Bendell said McCabe filled in admirably. Oliver Ames (0-1, 0-1) will try to bounce back on Friday when it hosts Foxboro.